Wednesday I shared with you my adventures in Minnesota. If you missed it, you can read about it here. Day two was a much less adventurous day with some great friends. I met Barb and Deb on the retreat I went on last July in Oelwein IA with Bonnie Hunter of Quiltville and Jo and Kelli Kramer of Jo's Country Junction. These two ladies were the life of the party. 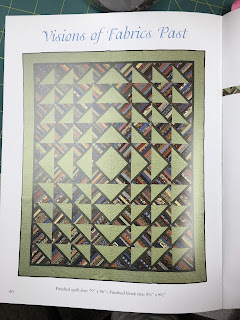 We've kept in touch and in January started a Longarm challenge with the 3 of us that I've been posting about. You can read about the March Longarm Challenge here or the February Longarm Challenge here. When I called to make plans to meet them, Barb says that her Church Mission Group of Women was meeting to work on charity quilts. Would I like to join them. Well of course, I'd love to. I'm so glad I did. These ladies are an inspiration to everyone. They can make some mean "Carmel Sticky Rolls" and they can quilt up a storm too. Oh and laugh, and laugh, and laugh some more. They quickly put me to work, after I indulged in the Carmel Sticky Rolls (did I mention they are to die for?). I sewed scrappy piano key strips together. I was very happy to do it. I haven't sat down at a sewing machine in over a month, since all the packing started. Oh how I've missed it. While I was doing that, another lady was sewing another type of strip set together. Eventually I sewed my strip set to her strip set and then they were cut in half square triangles by Barb. Maria pressed them open, and another lady set them together into a quilt top. Meanwhile, Deb and Michelle were working on this quilt top. Three other ladies were working on tying 2 quilts and yet another lady was binding them after they were tied. They then accumulate them until they have a nice stack and deliver them to their charity of choice. This quilt was a quilt that was made by one of their members, quilted by Barb, donated to the church, and auctioned off for yet another mission. It was absolutely beautiful. All of the applique was needle turn applique and Barb did some gorgeous custom quilting on it. It was purchased by these ladies who will hang it in the Church Narthex. My spark has been ignited again. I can't wait to be back quilting, and piecing, and sewing. The moving truck will be here Saturday and unload in Texas on Tuesday. I wonder how long it will take me to unpack so I can get back at it again. It is a very praiseworthy and very follow-up event.